Plans to increase the traffic volume on the M6 Toll by improving signage won’t work according to a leading motoring chief. The Toll, also known as the Birmingham North Relief Road, was opened in December 2003, with the aim of reducing congestion on the road and motorway network around the Midlands. One of the busiest sections of the M6, around Birmingham, the motorway was carrying up to 180,000 vehicles per day, when it was designed for only 72,000. The Toll has reduced some of the congestion, but was estimated to be taking 75,000 vehicles a day away from the M6 and current figures show that it is falling well short of that target with only 56,281 vehicles a day using the Toll road during the week. Whilst critics point to the high cost per journey, £5.90 per car, the Midlands Connect transport group has proposed the use of digital signage ahead of the Toll approach which would give estimated time savings by using the Toll. Other suggestions have included improving the A46 Expressway, making it a link to the M1, another benefit of using the Toll. 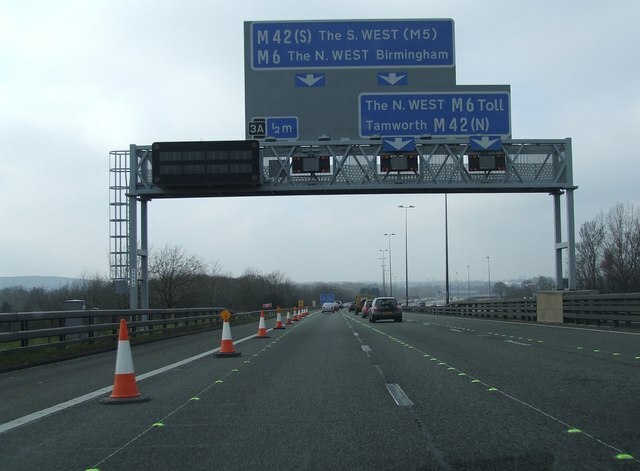 With traffic projections for the M6 Toll falling well short of expecations, the road was put up for sale in 2016 and was bought by an Australian pension fund, which would make a reduction in costs unlikely.